Jimmy would love to hear from you. CLICK on CONTACT/INFO in top menu and ask him any question you'd like -about his career and/or ventriloquism. Select questions will appear below. Q: Is Farfel a hand puppet or is he controlled like Danny is, via a head stick? (Alex K., Elwood, IL) A: Farfel is controlled like Danny via a head stick. There have been toys made of Farfel by Juro that are hand puppets but the original Farfel is a hard figure made by Frank Marshall. Farfel is hand carved out of basswood like Danny and covered in fur. Q: What resources did you have to learn Vent? Did you use books or a teacher to learn your vent techniques? (Chris J., Commerce, MI) A: I was self taught as a young ventriloquist and learned from my mentor, vaudeville ventriloquist Herman Stoike, Uncle Herman, that I was doing it all wrong and he taught me the proper technique. His instruction was one of the inspirations for my developing the Instant Ventriloquism albums. Q: You don't have any soft puppets; do you prefer hard puppets? 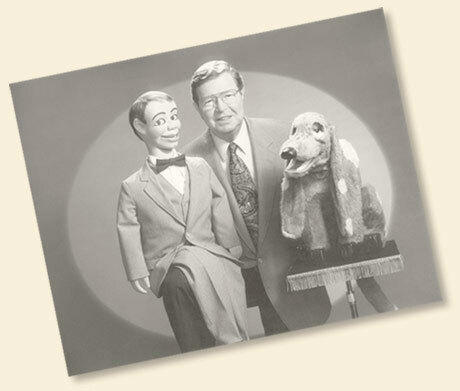 (Richard A., Omaha, NE) A: I have always used carved wooden "hard Puppets" (Danny O'Day, Farfel, Humphrey Higsbye and Ftatateeta) in my live performances, but my TV series, "Studio Ninety Nine and a Half" in the 1960's also included several hand or soft puppets, manipulated by me, to augment the cast. Juro Novelty Co. produced a toy version of Farfel in the 1960's, which was a soft hand puppet, and the Nestle Chocolate Co. produced their version of Farfel in the soft puppet version in the 1990's. I still prefer my original hard figures, but I also realize that the important part of ventriloquism is the manipulation of the figure. A soft puppet can be as effective as a hard puppet depending upon the skill of the manipulator. And a soft puppet is usually more economical, as the beginner can make one with a little imagination! Q: You've received many accolades and awards over the years. How meaningful was the tribute for you at 2011 International Ventriloquist ConVENTion? (David H., Pittsburg, PA ) A: The accolades and awards I have received over the years have been very important to me, but the tribute at last year's conVENTion was not just overwhelming, but the highlight of my long career! Being honored by my peers and many friends in my 83rd birthday year makes me humble and very proud to be a member of the ventriloquist community. What a thrill to have my name on a building at the Vent Haven Museum! My cup runneth over! Q: What does it take to become a professional ventriloquist? (Celia N., Lone Pine, CA) A: Becoming a professional ventriloquist takes a lot of ambition and drive. You have to have confidence in yourself as a performer and be ready to accept negative criticism. Each performance, whether well received or not, should be a learning experience. What went well, make it better; what didn't work, fix it. It's a profession, like anything else, and needs your full attention. There's no formula for success, but you have to love what you're doing and believe in yourself. Q: What was your favorite T.V. show experience? (Bobby S., Miami, FL) A: My favorite TV experience was early in my career, in the 1950's, when I made my first appearance on the “Ed Sullivan Show.” It was my first national exposure and I was very nervous. My performance was going well and I was about to launch into my “big finish” when Ed stepped in, said thanks, and I was finished. Of course I thought I had “bombed” and was cut off. Happily, Ed came backstage and apologized saying the show was running long and I had to be cut. He had me back the following month and it helped to launch my television career! I appeared on his show ten more times over the years. Q: I've been doing ventriloquism for a while and I can do the difficult letters very well. Could you tell me how you make the dummy look so alive and how you create a voice for your dummies? (Aayush M., Oakville, Ontario, CANADA ) A: I'm pleased to hear you have mastered the difficult letters. Good for you! Making the figure look alive simply means keep it moving. I don't mean exaggerated, but natural moves while you are speaking. He should be reacting to what you say when speaking to him. Don't let him "just sit there" when he doesn't have a line. If the audience reacts, he should, too. This is good practice in front of the mirror. He should always be moving, even if slightly, to keep him alive. Here's a tip: Many vents tend to let the puppet lean away from them. Keep the puppet sitting up straight. It's more natural. Creating a voice is more difficult. What does he or she look like? Is it young, a higher voice, or older, a lower pitched voice, a character with a slow drawl, or perhaps an accent? Look at the face carefully. What would you expect it to sound like? Q: I have three questions, first, do you perform with Ftatateeta any more? Mark K., Paddock Lake, WI A: Poor Ftatateeta! She is one of my favorite Frank Marshall figures...She's a beautiful Cheshire cat, colorfully painted and elegantly dressed, but her character, a loud-mouthed cat, never really registered with audiences. So I retired her, but I bring her out occasionally just to display what a beauty she is! Q: What figures have you retired? A: In addition to Ftatateeta, Humphrey Higsbye. He worked in my act with Danny O'Day long before "Farfel" was born. He worked well as a foil for Danny and was in the original "Rag Mop" routine until Farfel came along and stole his part! These days I work with Danny and Farfel exclusively, so Humphrey has retired, reluctantly. Q: Is it difficult emotionally to retire a figure? A: Yes, it is difficult, emotionally, to retire a figure that you have given birth to. If I had my way I would work with all three at the same time, but that is impossible in the venues that I work today. Q: Was Humphrey ever used as a "stand alone" character, or was he always used in conjunction with Danny? Peter W., Los Angeles, CA A: Humphrey Higsbye was never used as a "stand alone" figure. He was a perfect foil with Danny O'Day's quick wit and Humphrey's slow to catch on delivery. But he could keep up with Danny singing duets to "Rag Mop" and other popular songs of the day, and could flirt with Betty Norman when she was on stage with us. Q: Was any thought given to using puppeteering techniques a la Winchell (e.g. "human" hands) for the Nestle' commercials? Mary M., Chicago, IL A: I never attempted using Paul Winchell's technique of using human hands for a lifelike effect, but I did use puppeteers to manipulate one of my characters when we were separated, as in the Nestle commercials. I used Ray Austin a lot. He was a fine ventriloquist and also an excellent manipulator. He managed the figure, but I always did the voice. Q: Danny had a walking body, didn't he? Was that ever used in a performance? Whatever happened to that "walking" body? Monica E., Phoenix, AZ A: Danny's "walking body" crafted by Frank Marshall, was lost in a basement flood! It was used only once in a Texaco commercial, and I still hear from people who remember seeing it! Q: What was the most memorable moment from your career? And who were your idols? Michael O., Auburndale, FL A: The most memorable moment in my career would have to be in 2011, when I was honored by my peers at the International Ventriloquist ConVENTion with a Lifetime Achievement Award. It was called "70 Years of Laughter" and a building at the Vent Haven Museum was named after me. You can see a picture of Betty and I standing in front of the building on my "Links" page. In my youth my idol was Edgar Bergen, who with his figures Charlie McCarthy and Mortimer Snerd were popular on radio and television. I learned a lot from listening and watching them. Q: Why did Juro, the manufacturer of the original Danny dolls, release an unofficial character Hayley 'O' Hara? Aidan G., Oakmont, PA A: Juro had me create the character "Hayley O'Hara" to sell with the Danny dolls as his "girl friend" but we never had a full sized figure made and I never performed with her. Q: Who were the commercial sponsors for the TV game show you hosted COME CLOSER? Ashley S., Columbia, SC A: COME CLOSER did not have an advertising sponsor. It was, what was called at the time, a "sustaining" show. Sustaining shows were shows that were fully financed by the network, in this case ABC. The networks would often charge affiliates a small fee for carrying these shows in order to finance them. Sustaining shows ran for various lengths of time. COME CLOSER ran a little less than a full season. Q: Your partner Danny O’Day is clearly a wisecracker, but what exactly is Farfel’s personality in regards to Danny? Emily R., Blackwood, NJ A: Danny is as you said, a smart aleck and Farfel's job was to put him in his place, humorously. So the two worked off each other very well.